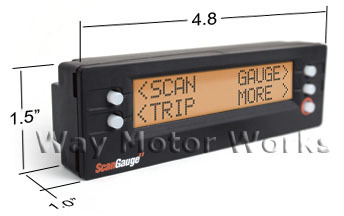 There are 30+ gauges you can display, but the scangauge also allows you to add other gauges by programming in extra codes from their website. #1 Coolant temp, scangauge gives it down to the degree, you can watch the thermostat open and the temp drop with that and the fan coming on. #5 Boost, done through using the MAP sensor, it will display it in absolute, or you can program to actual. These are the most used gauges. Along with being able to read codes, clear codes and figure all sorts of fuel mileage functions. Excellent product, Excellent price.. wish I had bought one for my other minis. See my review. Use it all the time. Can program it do calculate BHP and many other interesting measurements. Code scanner lets me know if its just an O2 sensor or something more dire. Since the Mini has no gauges except a Tach the scangaugeII is an excellent way to monitor a lot of functions.